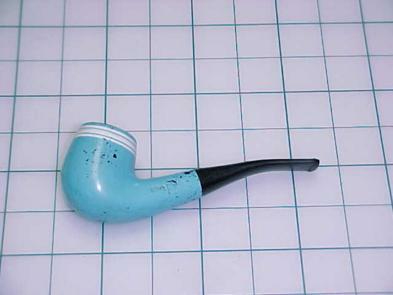 The value of pipe #217 is n/a points. As careful readers of these pages know, Pam Mach frequently offers pyrolytic graphite lined pipes on eBay. When I won the bidding on the white Bent, Pam willingly included an orange Bent that had received no bids and a blue Bent that had too much paint damage to be offered for auction. The pots are duplicate pipes and, after I sort out which ones are the better examples, either the former exemplars or these will be offered on the Pipes for Sale page. The bent will stay in the collection until I get a better example. Which finally happened! It is now on the Pipes for Sale page. Within two weeks, Richard Kaminski found and bought it.